Get advanced notice of new releases, bonus content, and so much more. Enjoy some of the best short fiction being published today in this three-book bundle containing three fantasy volumes of Fiction River: An Original Anthology Magazine. Fiction River is an original fiction anthology series. Modeled on successful anthology series of the past, from Orbit to Universe to Pulphouse: The Hardback Magazine, the goal of Fiction River is to provide a forum for “original ground-breaking fiction of all genres.” Each Fiction River volume comes in ebook and trade paperback format, published by WMG Publishing, and features some of the best new and established fiction writers in publishing. Dean Wesley Smith and Kristine Kathryn Rusch are award-winning editors, as well as award-winning writers, and act as series editors for the anthologies. For more information about the authors or Fiction River, go to www.fictionriver.com. 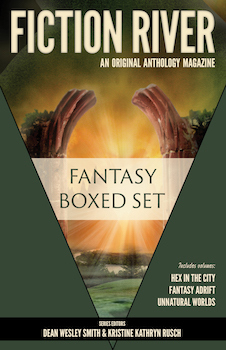 This bundle includes: Unnatural Worlds, Hex in the City, and Fantasy Adrift. From a funeral procession in Asia to an ancestral estate deep in the heart of a vaguely Victorian forest to a carriage accident in the vast universe of The Runelords, Unnatural Worlds takes readers on a journey to the far side of the imagination. Funny, heartbreaking, frightening, but most importantly, memorable, the original stories in this anthology go places few writers dare reach. Unnatural Worlds marks the perfect start to this brand-new anthology series. Edited by: Kristine Kathryn Rusch & Dean Wesley Smith. Original stories by: Kristine Kathryn Rusch, Dean Wesley Smith, Devon Monk, Ray Vukcevich, Esther M. Friesner, Annie Reed, Leah Cutter, Richard Bowes, Jane Yolen, David Farland, Kellen Knolan, and Irette Y. Patterson. Urban fantasy offers a diverse playground for some extremely powerful stories. Professional writer and editor Kerrie L. Hughes pulled some fantastic tales out of fourteen top writers for this fifth installment of Fiction River. Set in urban lands from modern Portland, to a future Detroit, to a wild Washington, D.C., and ending the tour in London, these top writers take the idea of “Hex” and stretch and twist it into stories with a magickal grip on the imagination. Edited by: Kerrie L. Hughes. Original stories by: Jay Lake, Lisa Silverthorne, Nancy Holder, Lee Allred, Stephanie Writt, Seanan McGuire, Anthea Sharp, Dayle A. Dermatis, Dean Wesley Smith, Annie Reed, Jeanne C. Stein, Leah Cutter, Kristine Kathryn Rusch. From fairy tales fractured into unrecognizability to Russian mobsters hanging out with zombies, from New World slavery to modern Alaskan cruise ships, the stories in Fantasy Adrift sail across the genre. Two writers make their fiction debuts next to bestsellers Steve Perry and Dean Wesley Smith to take readers on a journey of the imagination—as only Fiction River can do. Find out about our discount schedule by clicking here. Copyright 2014 by WMG Publishing, Inc, background art copyright Niroworld/Dreamstime.